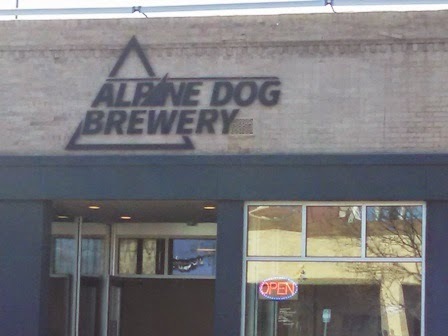 Alpine Dog is located at 1505 Ogden St - Denver, CO 80218, and according to Google Maps, this is a 29 minute drive (16 miles) from my home. Alpine Dog is a term coined by Coloradans. While we do love our dogs, this term goes deeper than that. It is a reflection of the people. In Colorado we love our mountains. It's where we go to play; it's where we go to exercise, relax, make friends and have fun getting away. 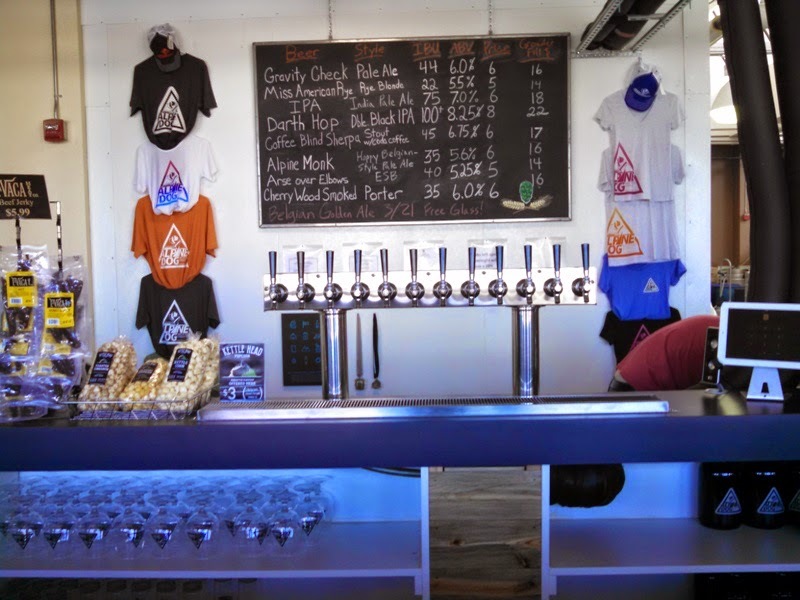 Whether its mountain biking, snowboarding, hiking 14ers, or just enjoying a brew and a view: we are the Alpine Dogs because of our passion for the high country. As someone who likes to consider himself an outdoorsy type of person, I really like that explanation. 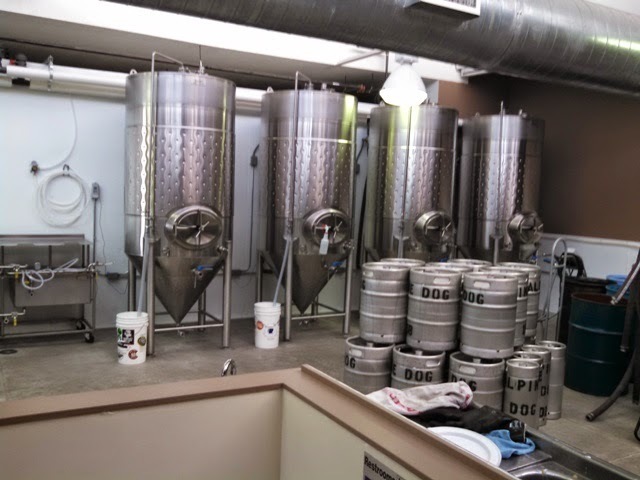 The tasting room is all shiny and new, and very cool looking. It certainly isn't huge, but a nice size for a cozy neighborhood drinking area. 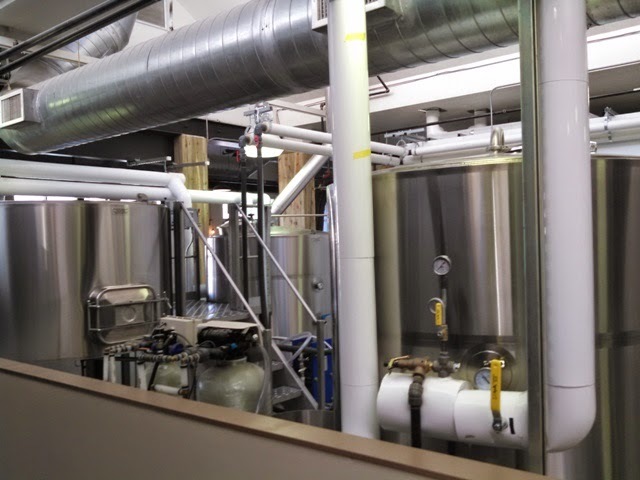 And, more importantly, the beer is really good. I had a sampler of all the beers they had on tap. Interesting that I don't think I've ever heard of a "rye blonde ale" before. 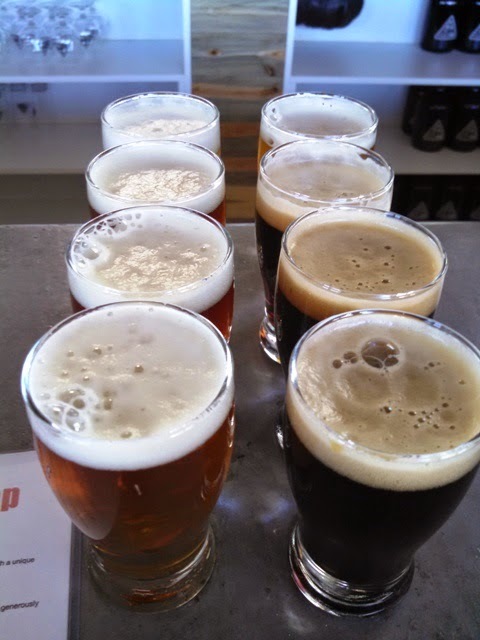 This was one of my favorites of the flight, and it is the beer that I took home in a growler. The rye was not overpowering, but enough there to add a little complexity to the malt. The hops are subtle, but there. It is a nice easy drinking ale. A nice pale ale. It has enough of a hoppy flavor to be tasty, but certainly not enough to be called an IPA or even a session IPA. This is one that I could drink all day long. This is more what I would call a Belgium IPA which is not my favorite style, but this one is pretty good. It has American hops mixed with the spice and fruit from the Belgian yeast strain. Not my favorite combination. If you like the Belgium IPA, though you will probably like this one. Rich, toasted, bready malt character and a big English hop profile. Not my favorite ESB in the world, but certainly very tasty. Unfortunately, I am not a fan of Smoked Cherry-Wood. I am sure if you like the character of smoked cherry wood, this is a great beer. Tastes a lot like coffee, which is what they were going for. I guess they nailed it. I liked it very much. Really good IPA. Lots of hoppy goodness without being overly bitter. My favorite of the flight. Everything a black IPA should be x2. Lots of citrus/tropical American hop flavor. The de-bittered black malts give complexity without overpowering the flavor. I enjoyed the beers. I thought it was a cool place. I completely suggest stopping by Alpine Dog when you are in the neighborhood. Check out and like Alpine Dog's Facebook Page. If you have a vote, please share in the comments below.